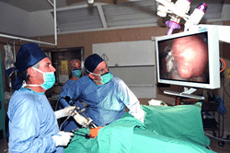 Low Cost Laparoscopy Hysterectomy at Top Hospitals in India. An organ that is obviously dysfunctional and has no overall advantage of being kept in the body should be removed. Most people get a Hysterectomy surgery done when they assume that the growths occurring could be malignant or cancerous, but not otherwise. Do not ignore Fibroids nor avoid Hysterectomy Surgery !!! Females having uterus fibroids and excessive irregular heavy menstrual bleeding start thinking that after Hysterectomy (i.e. removal of uterus) they would not feel like a woman anymore! They fear that they would lose their womanly hormones and look all shrivelled up and old. Usually women prefer to bear the symptoms and wait for the fibroids to get better or worse. Fibroids are known to shrink after menopause has set in completely but they may get worse before they get better. If there is an increase in overall size of the fibroids, then the doctors suggest removal of uterus & or ovaries, because they do not want a patient to get uterus/ovarian cancer later in life. Women are special. Women put their heart into taking care of everyone around them. That’s why at Safemedtrip affiliated hospital in India, a team of highly experienced medical professionals has developed the most modern medical & surgical care that promotes optimal health during each new stage of a woman’s life. Laparoscopic Hysterectomy Surgery costs about 4000 to 5000 US Dollars – Cost includes 4 days stay in a Private Room where a Companion can stay with the patient surgeon fee, medicines and consumables, nursing care, food and Airport Pick & Drop. Laparoscopic Assisted Vaginal Hysterectomy (LAVH) – It is a kind of a Total Hysterectomy which is less invasive and the post-operative recovery is much faster. Robot assisted laparoscopy hysterectomy – is a variant of laparoscopic surgery using special remotely controlled instruments that allow the surgeon finer control as well as three-dimensional magnified vision. Don’t fear! Take expert medical & surgical opinion now! At Safemedtrip affiliated hospital in India we have a world class technology & top leading doctors for giving you best care. Still for those who fear that things may go wrong, hormone replacement therapy can be taken in consultation with a gynaecologist. Afterall, being a woman does not only mean having ovaries. It is who she is. The progress of medical sciences and technology is to make our pain and suffering less and make us more confident to face life with vigour and zest. Let us make the best of it!